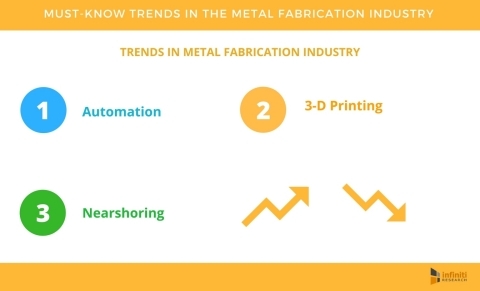 LONDON--(BUSINESS WIRE)--Infiniti Research, a global market intelligence solutions provider, has launched their latest list blog on the four must know trends in the metal fabrication industry to help companies diversify their customer base and accurately forecast demand patterns. Investments in global infrastructure projects have been proliferating over the past few years, and this presents a growing opportunity for the metal fabrication industry players to grow considerably in the coming years. The metal fabrication industry is highly dynamic and cyclical with its growth depending on the end-user industries such as energy, automotive, aerospace, and construction. Infiniti Research is a global market intelligence company presenting the strategic intelligence solutions to help in seeing beyond market disruptions, studying competitive activity, and developing intelligent business strategies. Listed below are the top four must know trends in the metal fabrication industry. Automation: Automation has helped metal shops simplify the act of cutting and bending sheet metal. 3-D Printing: 3D printing is a relatively new technology and has been used in the manufacturing industry to make product prototypes. Nearshoring: Nearshoring operations helped local tax incentives and the “Made in America” movement. With 14+ years of experience and offices across three continents, Infiniti Research has been instrumental in providing a complete range of competitive intelligence, strategy, and research services for over 550 companies across the globe. Advancements in technology and supply chain practices have brought drastic changes to the metal fabrication industry.